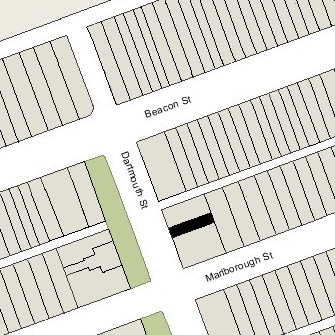 319 Dartmouth is located on the east side of Dartmouth, between Beacon and Marlborough, with 321 Dartmouth to the north and 137 Marlborough (317 Dartmouth) to the south. 319 Dartmouth was built ca. 1869 by Hiram P. Bean, mason, one of three houses (317-319-321 Dartmouth) built at the same time as a symmetrical composition, with a bow in the center and octagonal bays at either end. Click here for an index to the deeds for 319 Dartmouth. On April 1, 1870, 319 Dartmouth was purchased from Hiram Bean by John L. Curtis of Charlestown. On June 27, 1870, Hiram Bean acquired the property back from John Curtis and on the same day it was acquired from him by Maria Josephine (Sawyer) Richardson, the wife of leather merchant Thomas Owen Richardson. They previously had lived at 69 Charles. On June 25, 1873, she transferred the property into her husband’s name. Maria Richardson died in June of 1878. Thomas Richardson continued to live at 319 Dartmouth. In June of 1885, he married again, to Mary Rich Baker. 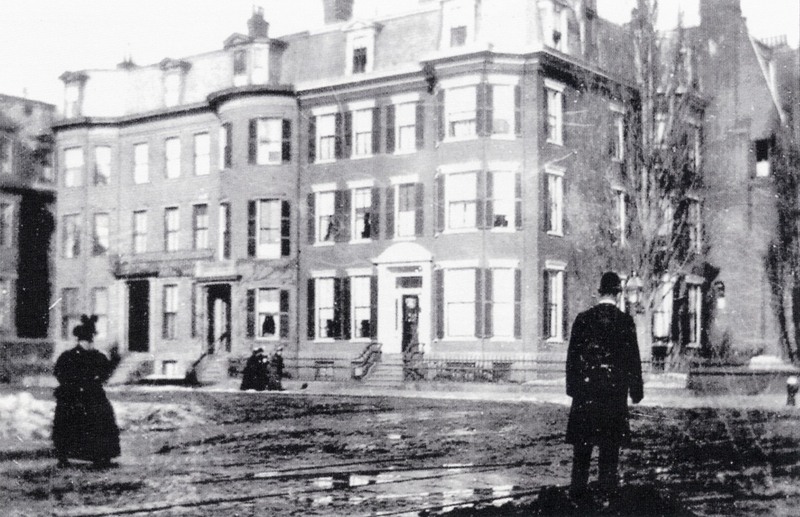 After their marriage, they lived at 131 Marlborough during the 1885-1886 winter season, and then at 265 Commonwealth. On September 30, 1885, 319 Dartmouth was acquired from Thomas Richardson by Timothy Thompson Sawyer. He and his wife, Mary Elizabeth (Stockman) Sawyer, were the parents of Thomas Richardson’s deceased wife, Maria, and previously had lived in Charlestown. Timothy Sawyer was president of the Bunker Hill Bank from 1885 to 1890, and also president of the Warren Institution for Savings from 1880 to 1903. He had served as Mayor of Charlestown from 1855 to 1857, and subsequently as a member of the Massachusetts House of Representatives and then the State Senate. Mary Sawyer died in November of 1901. 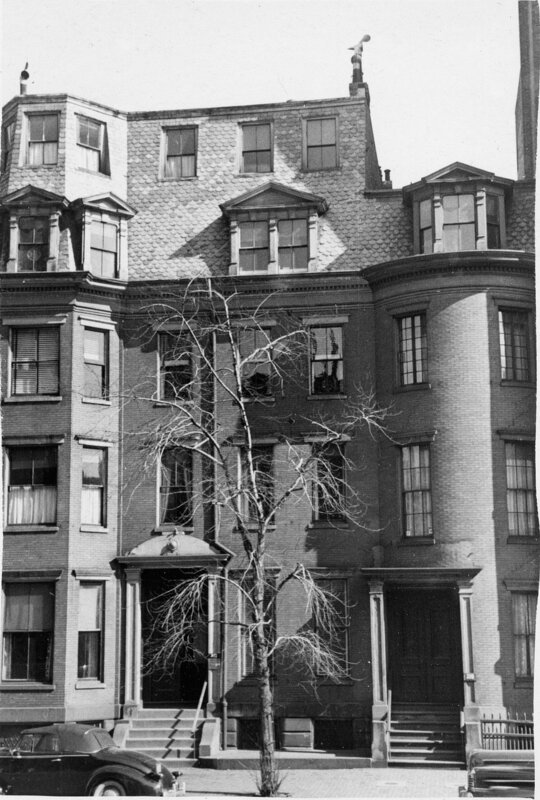 Timothy Sawyer continued to live at 319 Dartmouth until his death in September of 1905. The house was not listed in the 1905 and 1906 Blue Books. On January 24, 1907, 319 Dartmouth was purchased from Timothy Sawyer’s heirs by Elizabeth Perkins (Lee) Shattuck, the wife of Dr. Frederick Cheever Shattuck, a physician. They owned and lived at 135 Marlborough, around the corner from 319 Dartmouth. 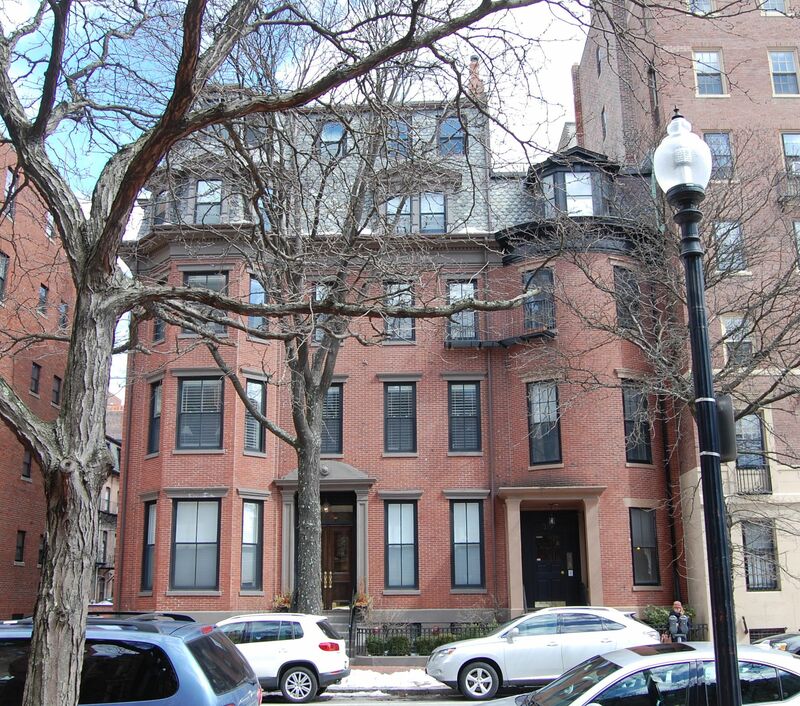 By the 1907-1908 winter season, 319 Dartmouth had been leased from Elizabeth Shattuck by Timothy Sawyer’s grandson, Clifford D. Sawyer, a banker, and his wife, Gertrude B. (Hershey) Sawyer. They previously had lived in an apartment at 270 Commonwealth. They continued to live at 319 Dartmouth in 1917. By 1918, they were living at 11 Lime. By the 1917-1918 winter season, 319 Dartmouth was the home of Elizabeth Shattuck’s son-in-law and daughter, Dr. Charles Pierson Richardson, a physician and surgeon, and Clara Lee (Shattuck) Richardson. They had married in May of 1917 and 319 Dartmouth probably was their first home together. Prior to their marriage, he had lived at 224 Beacon with his mother, Margaret White (Pierson) Richardson, the widow of Dr. Maurice Howe Richardson. He continued to maintain his medical office there. The Richardsons had moved by 1919 and were living in Brookline by 1920. Clara Richardson died in December of 1921. 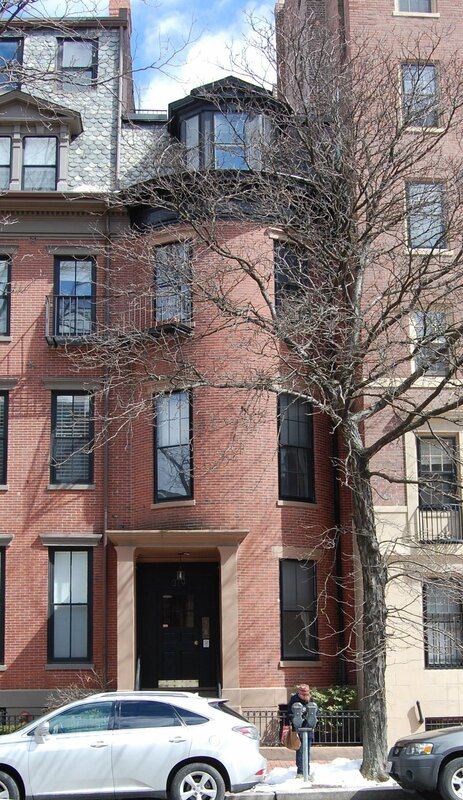 During the 1918-1919 winter season, 319 Beacon was the home of Henry Bancroft Sprague, treasurer of the Roxbury Carpet Company, and his wife, Louise (Hill) Sprague. By 1920, they had moved to 182 Bay State Road, and by 1921 to 3 Exeter. By the 1919-1920 winter season, 319 Dartmouth was the home of Clarence Vose Burrage and his wife, Alice (Nichols) Burrage. They had lived at 193 Beacon in 1918. They also maintained a home in Cohasset. Formerly a real estate dealer, he was treasurer of a rug and carpet company. By March of 1921, they had moved to 225 Marlborough. By the 1921-1922 winter season, 319 Dartmouth was the home of John Wallace Goodrich and his wife, Madeline (Boardman) Goodrich. They previously had lived at 145 Beacon with Madeline Goodrich’s father, real estate agent T. Dennie Boardman, who died in September of 1919. The Goodriches also maintained a home in West Manchester. John Wallace Goodrich was Dean of Faculty (and later Director) of the New England Conservatory of Music. Elizabeth Shattuck died in April of 1931. 319 Dartmouth became the property of a trust established in her will for the benefit of her daughter, Elizabeth Perkins (Shattuck) Bigelow, the wife of oceanographer and zoologist Henry Bryant Bigelow, and her son-in-law, Edward Pierson Richardson, the widower of Clara Lee (Shattuck) Richardson. On July 24, 1945, Madeleine Goodrich purchased the house from the trustees for Elizabeth Bigelow and Edward Richardson. The Goodriches continued to live at 319 Dartmouth until about 1949. The house was shown as vacant in the 1950 City Directory. On December 29, 1949, 319 Dartmouth was purchased from Madeleine Goodrich by Frank Sawyer, who operated it as a lodging house. His wife, Mildred (Farrar) Sawyer, owned 137 Marlborough (317 Dartmouth). In September of 1961, he applied for (and subsequently received) permission to remodel the house and convert it into five apartments. On February 15, 1963, 319 Dartmouth was acquired from Frank Sawyer by Edward H. Mank and Richard G. Maloney, trustees of the 319 Dartmouth Street Trust. The property subsequently changed hands. It remained an apartment house, assessed as a four- to six-family dwelling, in 2016.